The world's first commercially produced Christmas card made its debut in London, England in 1843. Sir Henry Cole commissioned artist and illustrator John Callcott Horsley to design a card to send to his family and friends. Cole being a shrewd businessman ordered 2,050 cards which he sold for one shilling each. 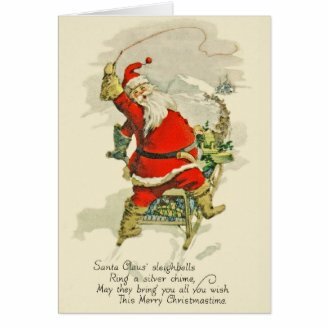 In 1874 lithographer Louis Prang began marketing Christmas cards in America, he was the first to do so, which is why he is considered the father of the American Christmas card. The idea caught on and pretty soon other printing companies were producing cards. Most notably in 1913 Joyce Hall entered the arena and formed Hallmark cards. 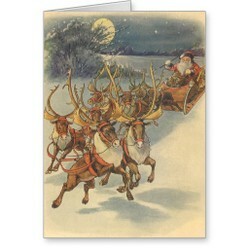 Santa and his sled dogs were scanned from a 1921 Christmas postcard. This vintage Santa is riding on a dog sled over the frozen tundra, bringing Christmas presents and good wishes to all the little boys and girls around the world. This card can be personalized with your own text on the inside, or by just adding your signature. Victorian illustration of a Merry Christmas holiday scene featuring Santa Claus and his reindeer delivering presents and toys all around the world on Christmas Eve. Santa is flying over the snow on a chilly winter night and a full moon helps guide the way. 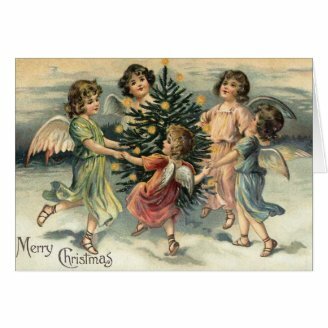 Merry Christmas Angels dancing gleefully around a Christmas tree. You can personalize this card with a saying or verse on the inside and your signature. If you don't like throwing anything away, here is a great way to recycle greeting cards. This video shows how to make a small trinket box from a greeting card, for any occasion. Use a bigger card to make a bigger box. 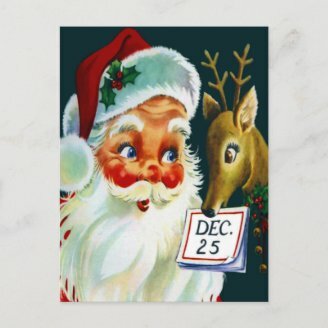 Here is one of Santa's reindeer, not Rudolph, reminding Santa that the special day is December 25. Santa's cheeks are rosy and he has a holly sprig in his hat. All ready to go on Christmas Eve. 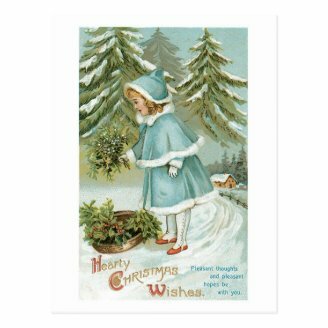 Little girl in blue coat and hat with white fur trim gathering pine boughs and pine cones in her basket. Wishing pleasant thoughts for everyone. 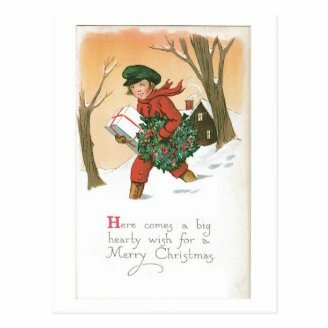 Young boy hurrying to deliver a Big Hearty Wish for a Merry Christmas. He's carrying a present for someone and a holiday wreath for the door. candy47, It's touching that they include compassion in the wishes, with feeding and clothing those who, as Rose Fitzgerald Kennedy always said, "were poor through no fault of their own." Do you have any ideas as to what is being drunk in the centerfold? The glasses make me think that it's not mulled wine. Nice! I really like the ones with the little girl and little boy. I found it surprising that it was three decades between the time Christmas cards debuted in England, and when they began appearing in the United States. These are pretty..paper is my thing, I just love vintage paper items of all kinds, both to enjoy and sell. Thanks blackspanielgallery. Working with the Zazzle module isn't easy when looking for products. These are great. You did a good job of finding them.